When it comes to houseboat electric windlass anchors, any tips on whether horizontal or vertical installations are the easiest? 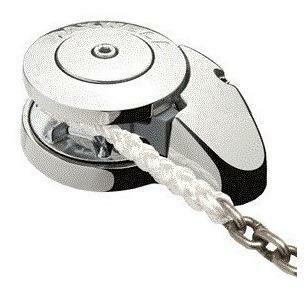 The reason I ask, has anybody installed a windlass on a Gibson houseboat? It would be nice to conceal it under the front hatch, but we are concerned about structural support. Has anybody had any trouble? Do any of the readers have any ideas? Thanks for any help, Ray. In our houseboating lives, my wife and I have mastered the techniques involved in the smooth operation of raising and lowering an anchor. Yet all of this was accomplished with many episodes of trial and error. The handiest tip for people who don't have an electric anchor is to use gloves. The addition of a windlass on a boat is one of those items, or options that just makes good sense. Especially considering the size and weight of some anchors on these large boats nowadays. Naturally the easiest option is to have it pre-installed by the manufacturer before purchasing a new boat, however what to do when you have a houseboat without one installed. When it comes to a new installation, each case or boat has to be analyzed to see how, and where the best location is, to achieve the greatest structural and physical strength. 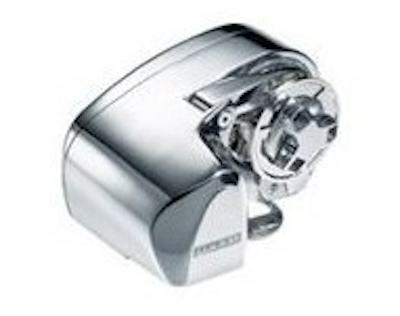 An electric windlass requires a fair amount of torque, which translates into a fair amount of power (or current), so you have a few choices. Install a battery close by in the bow, or run large cables to the engine room, and run it off the houseboat battery banks. The rest of the installation is circuit breakers for protection, and some type of joystick controls (dual helm) for the raising and lowering. You can use or install either types of windlasses, whether horizontal or vertical, as both have their advantages, depending on the available space in the bow locker or hatch area. I would recommend to have a look at what type of rode you want to use. Decide whether you want to use rope, rope and chain, or only chain. What Windlass Models are Available? If you're a technical spec type of person, and you're interested in reading more about the different sizes, speeds, torque values, and prices, have a look at models like the Powerwinch windlass, the Maxwell windlass, and the Lewmar windlass. Now, I have installed windlasses on other boats, but never installed one on a Gibson, so I will leave those specific details to someone that has. I am sure that someone who has, will gladly share their installation tips and ideas. Lastly, hopefully some of our readers will share and post comments about their electric anchor, or houseboat windlass experiences. Feel free to use the "Click here to post comments." link found near the bottom of this page. 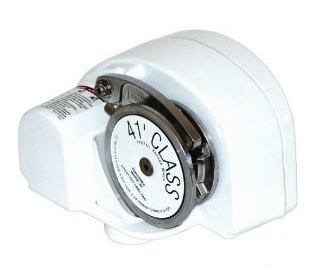 Comments for Houseboat Electric Windlass Anchors - Horizontal or Vertical Installations? Ray, I really enjoyed your post. Unlike the rest of you, I don't even own a trawler yet. I'm spending my time learning about all the components of a houseboat. Now I know what an electric windlass is. I'll know what everything is. I installed a horizontal windlass on my 2001 41ft Gibson last summer after my wife was complaining about being the deck hand. Installation was straight forward. The windlass was mounted off to the left side of the midline. Just make sure you have enough space to work and fasten the drive. I purchased a battey with a trickle charger that I mounted in the port side. Made a hole in the wall over the forward head for the power cable. We also purchased a remote wireless switch to operate the anchor, but I managed to drop it in the Mississippi. The inside switch works OK, but we'll be looking into getting a foot operated switch this summer. We are using a combination chain/rope. The rope had a tendency to get stuck in the windlass mechanism, so we'll consider using chain only. You will also have to build a bin for the chain/anchor rope in the front hold. Hi Ray, just read your post. When I read it I thought that I may have written it and forgot I did. I have a Gibson which I also want to mount a windlass on. It has been a project that has so far spanned a lengthy time. I have been reading a lot and buying required parts as I have found good deals on them. I decided to go with a horizontal because of cost and a lower profile than some of the Verticals. I decided that below deck mounting is not an option as I often set/retrive the anchor by my self and if something went a foul I was concerned with everything being mounted below. I have also decided to use rope/chain because of weight. The major problem I have right now is where to mount it. It will have to be off center to allow for front loading off a beach. The problem is the distance it needs to be to allow for the anchor and mount. I don't want it in the middle of the deck. Power is no problem for me as I have my inverter bank mounted in the forward hold. Gibson isn't very helpful as I believe they have only factory mounted a windlass on one of their houseboats. I am toying around with the idea of running the line around a deck mounted pulley so I can offset mount the windlass to the side and forward further. Sure would appreciate if you could share anything you have found also as I am still in the design stage. By The way - My name is Ray also but I am from Iowa and do my boating on the Mississippi River. Ray, thanks for sharing some great information on the windlass situation with Gibson houseboats. Normal installation on a Gibson is a horizontal unit offset to the bow rail opening. It is usually bolted to the deck as far forward as possible while still MAINTAINING ENOUGH DEPTH, under the unit, in the bow compartment, to receive the anchor line. The reason for mounting it somewhat forward and to the side of the rail opening is to reduce the, on deck, trip hazard as much as possible.